The workshop begins on Monday 16 September in the afternoon and ends on Friday 20 September after lunch. (*) Poster contributions can always be submitted. However, poster abstracts submitted after the deadline cannot be included in the workshop booklet. 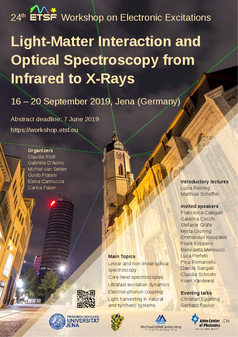 The early-bird registration fee (until 26 July 2019) is 200 €. The fee for late registration (after 26 July 2019) is 250 €. All bank charges must be covered by the participant. Payments that cannot be traced due to insufficient reference are considered as not paid. The fee includes participation in the workshop, coffee breaks, lunches, and social dinner, but not accommodation. At the workshop, all participants will get a receipt confirming their participation and the payment of the fee. If you need an invoice, please request it by mail here as soon as possible. Include the IBAN, SWIFT, and VAT numbers of your institution when you request an invoice. We will not be able to create one without. For cancellations after 16 August 2019, a fee of 50 € will be charged. A limited number of grants will be available to partially cover participation expenses. Submission of an abstract and a motivation statement are required to apply. Grant applications without motivation will not be considered.